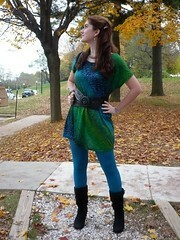 The Joy of Fashion: Monday's tip of the week: Dare to wear colored tights! 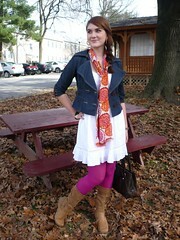 Monday's tip of the week: Dare to wear colored tights! Try adding them with a patterned dress or skirt that includes the color of the tights. So if you have a dress that has a pink, blue, and mustard in its pattern, chances are it would look great with either pink, blue, or mustard tights! I would keep the rest of the outfit neutral in order to not overdue it. 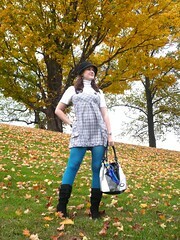 Another way to wear bright colored tights is to make them the main focus of your outfit. In order to do this, keep the entire outfit in neutral colors (such as black, white, brown, and gray) and then just add the bright colored tights. By adding a pop of color with the tights, the entire outfit makes a bold statement. You can also add a scarf that includes the color of the tights in order to give one more focal point, but that is completely optional. great tips! 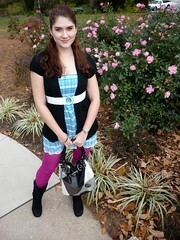 i'm starting to get into the colored tights trend, too:) love how it gives a bit of oomph to an outfit. i like layering tights over leggings for extra warmth. you sure know your stuff and it looks great. Hola Marie, no es ninguna molestia, el gorila lo compré hace varios años para mi novio en una pequeña tienda en Manizales Colombia, la verdad no tengo idea de el nombre del lugar, Fue en un pequeño centro comercial "Parque Caldas" pero apuesto que podrías conseguir un parecido en cualquier lugar, son muy populares. Me gusta mucho tu blog, los colores y todo, y yo tambien estoy adicta a las medias en todos los colores y estilos, me encantan. so i went out at the beginning of this season and basically bought a rainbow, and you'd think that since the rest of my wardrobe is full of shades it would be super easy to throw in a pop... but its so daunting! I'm so jealous of your ability to mix colors brilliantly! Sure makes sense to use tights for that extra splash of color and interest in an outfit. I have never used them myself so can only admire those who are more daring than me!!! Call me chicken... its okay. jajaja you arent chicken! I still dont dare to wear patterned tights, although I have seen many people pull it off so nicely. Thanks so much for all the sweet comments everyone! Khusboo magazine is a surat based women Fashion Magazine website which provides information about fashion tips and ladies Indian garments. This website is basically fashion and modeling website.